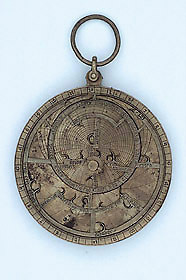 This astrolabe, attributed to the workshop of Jean Fusoris, is a typical late Gothic example. The rete bears star pointers of the flambent type, and the star 'Cornu Arietis' is wrongly placed as a southern declination star. The characteristic tracery of the rete of late Gothic astrolabes may owe much to the diffusion of the instruments of Jean Fusoris. The instrument is very similar to Epact 35795.